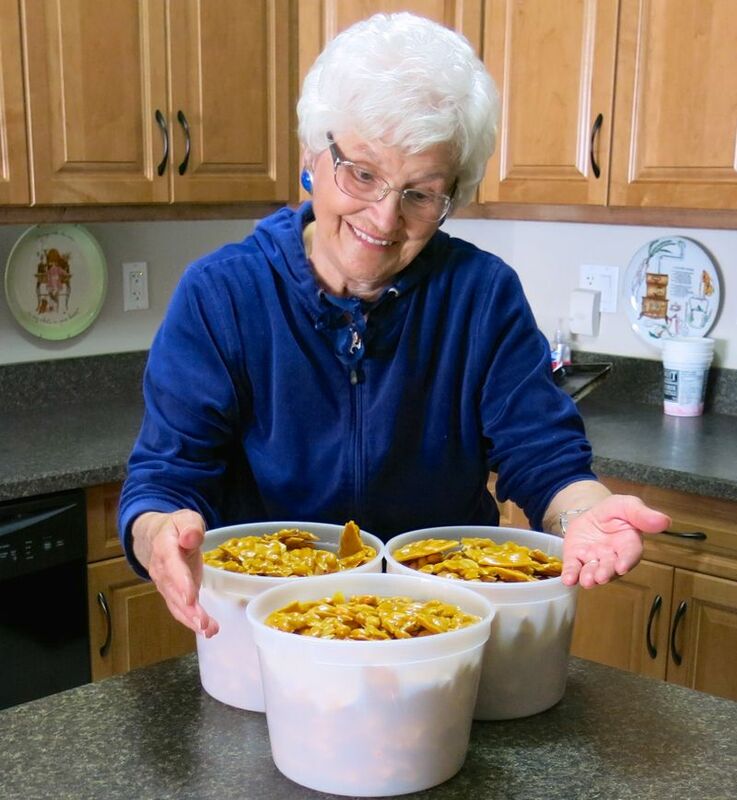 My mom, Helen McKinney, is famous for her homemade peanut brittle! Mom is 85 April 21, 2015. 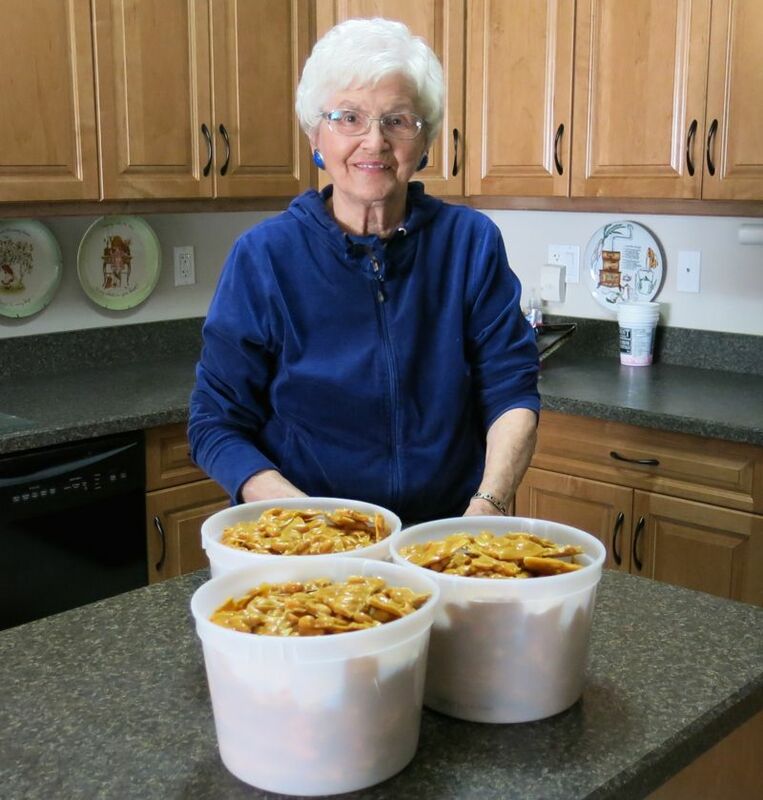 We are hosting an afternoon tea party on April 19 to celebrate this milestone that so few reach in life, and she is treating her guests with her famous homemade peanut brittle! And so it is. Hahaha! With one hilarious exception: she is doing it herself. My mom is unstoppable! 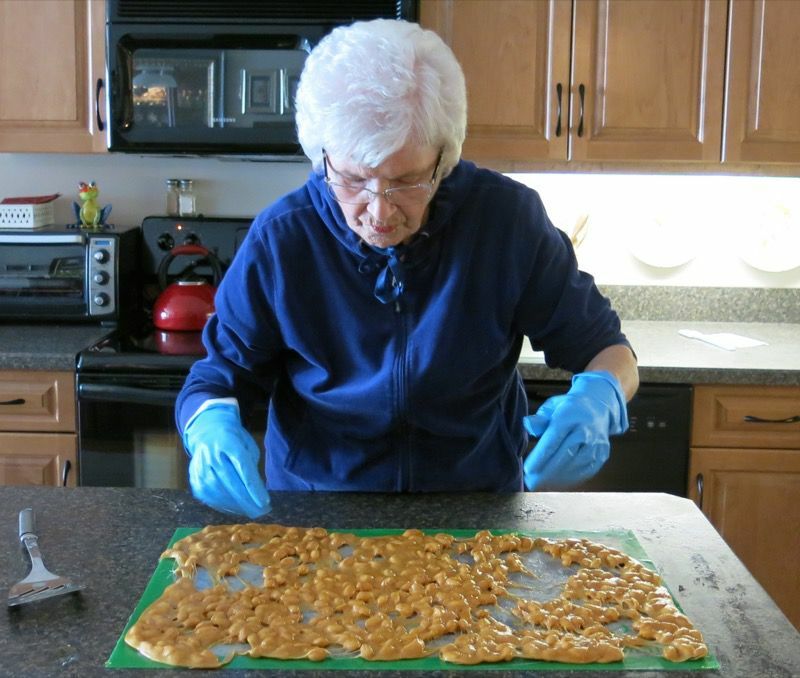 During a visit to Ruth Harrison, Grandma Maude’s sister-in-law, in her North Dakota farming community in the late 1960’s, Grandma Maude was served homemade peanut brittle and was smitten. 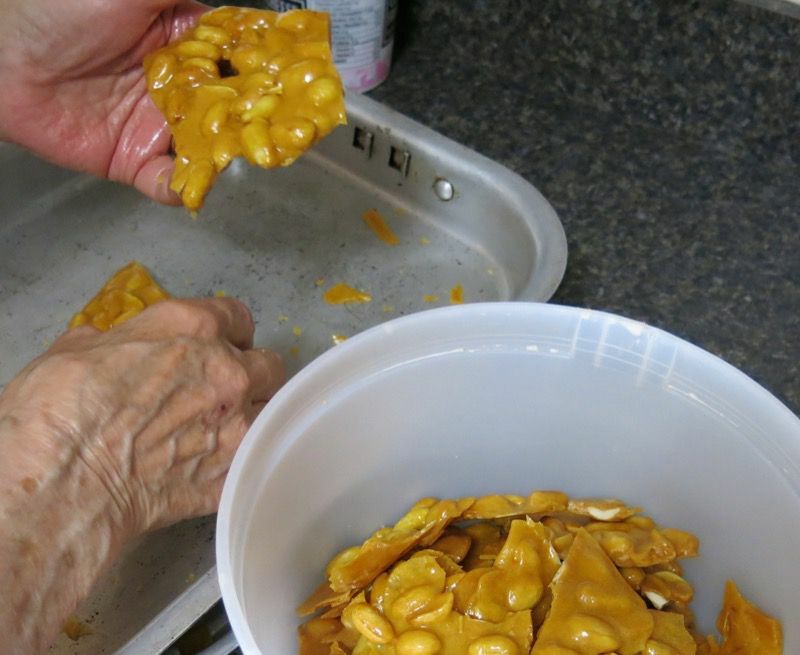 At that time, the raw peanuts were encased in the bright brick red peanut paper-like covering. Home witmh the recipe, she and mom followed it to a “T” then eventually made it with the raw white peanut. 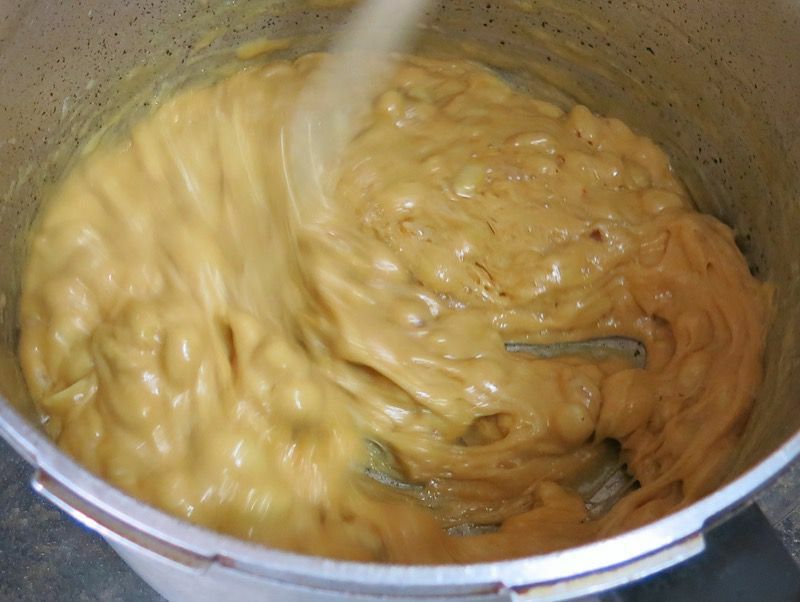 This has been our traditional family recipe for the past 50 years (almost). Mom never makes one batch. 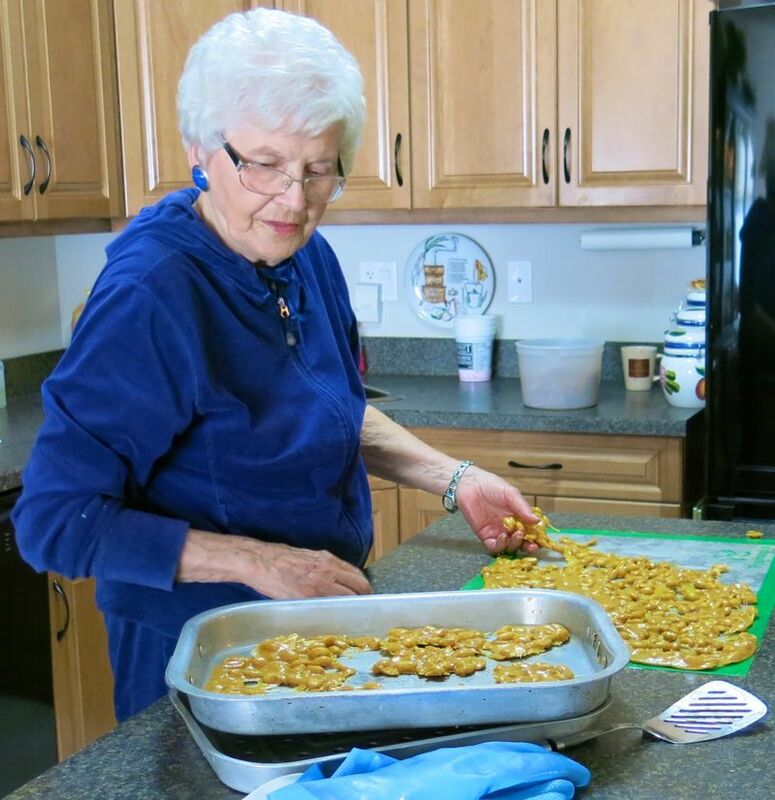 Born and raised on a central Alberta farm, she has “cooking for the trashers” ingrained in everything she does in the kitchen, even now. She and dad used to make up to 20 batches at one time, before Christmas, in the 70’s and 80’s. They could just not keep up with the demand. Once it was gifted to anyone, that person would beg for it the following year. So, if anyone “new” was shown appreciation with such a parcel, that person would also be looking for more the following year. 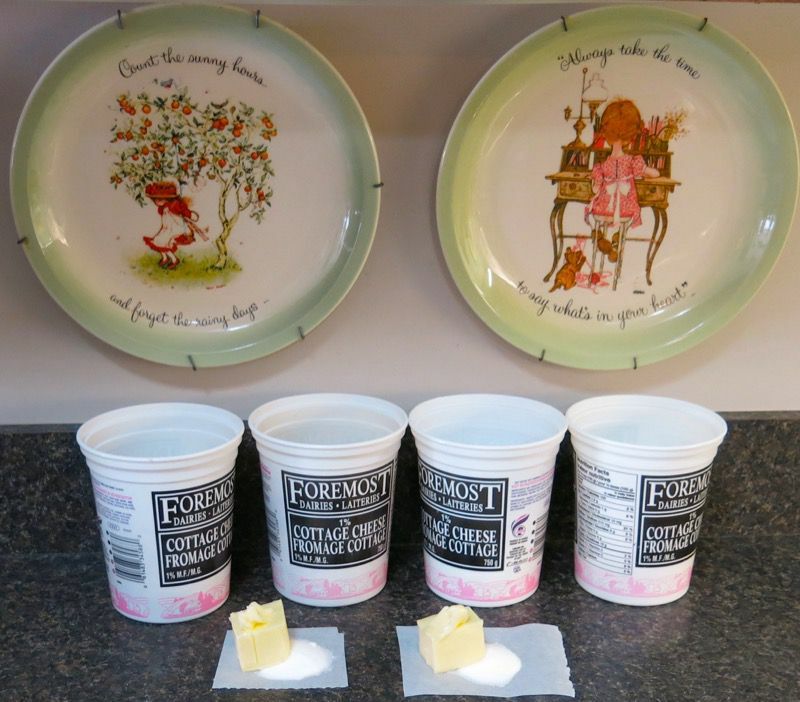 Mom lines up 5 containers of pre-measured sugar, 5 containers of pre-measured peanuts, 5 little papers with pre-measured salt and baking soda and adds the 5 pre-measured pats of butter on each. 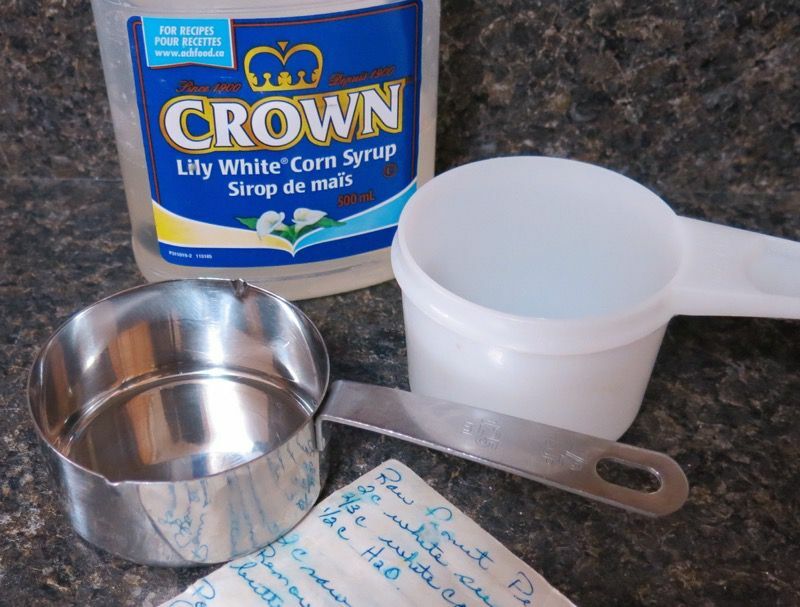 She actually owns a 2/3 measuring cup, and has it and her 1/2 cup out for the corn syrup and water; pre-filling each as she prepares each batch. 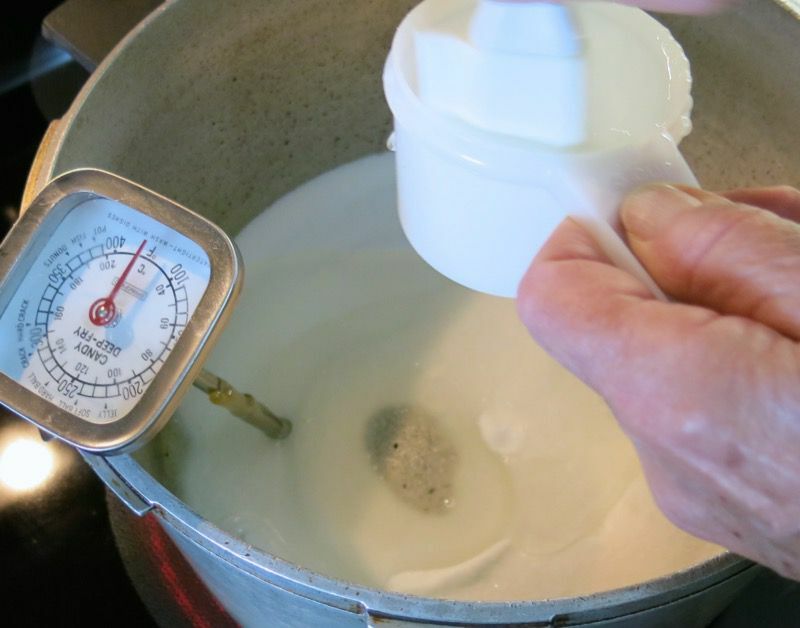 I arrived to record this process after she had made the first three batches. Ingredients for the last two line her kitchen counter wall. Heavy pot a must. Good thermometer a must (with large numbers for we blind elderly gals). Into the pot goes the sugar, corn syrup and water. 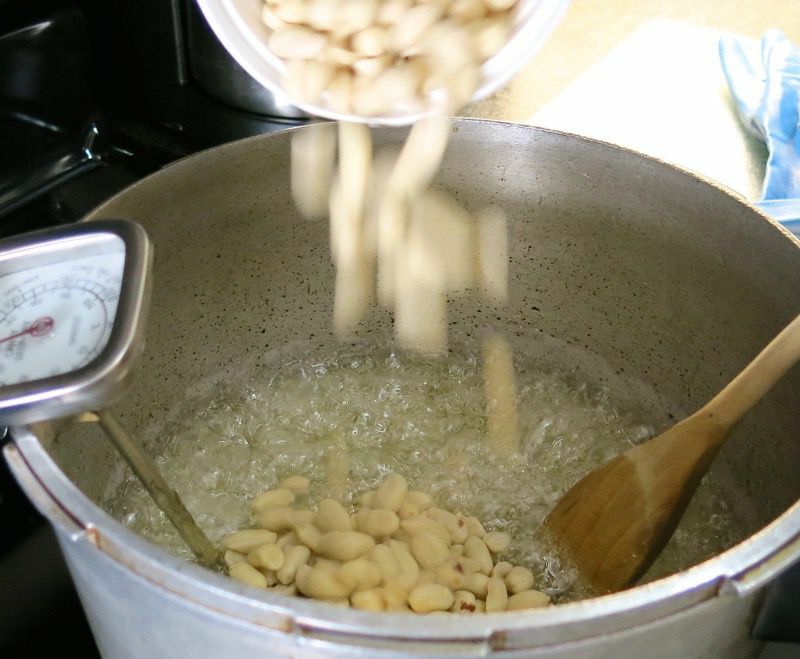 It doesn’t take long to reach 230ºF; at that point, raw peanuts are added and the mixture is stirred rigorously and constantly until the final temperature of 300ºF is reached. 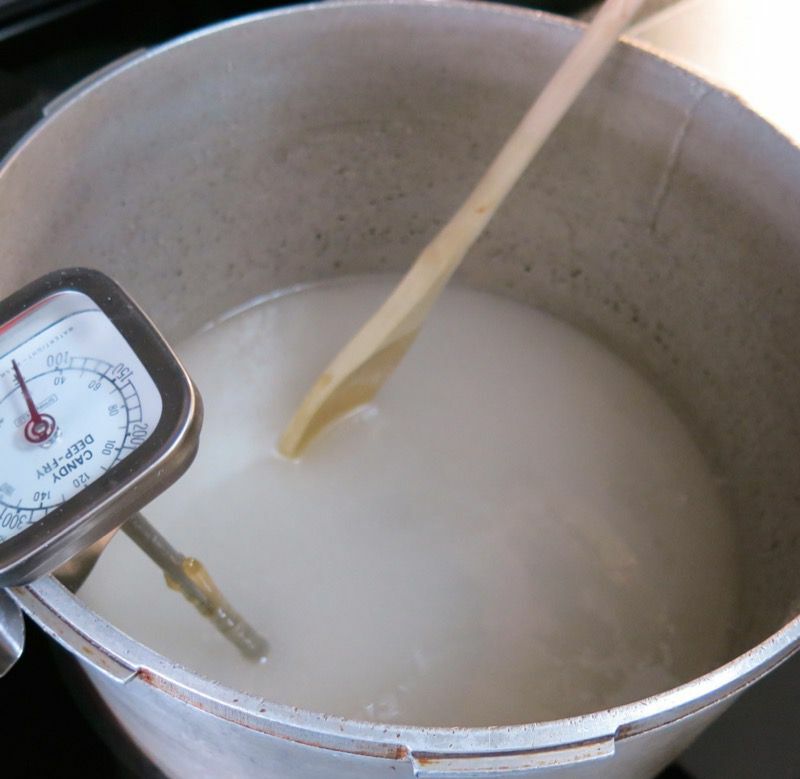 The pot is then taken off the heat…. 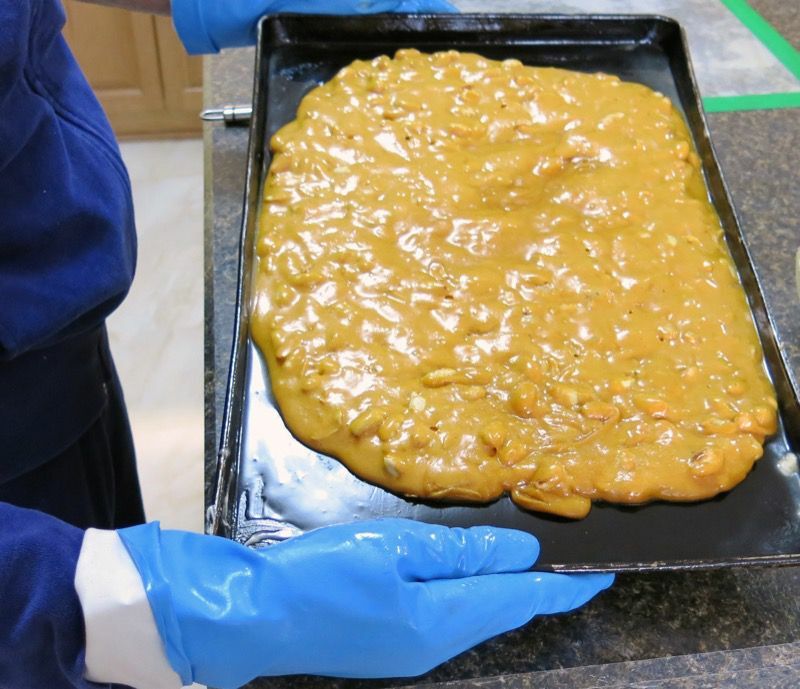 … all ingredients are poured onto a well buttered teflon coated cookie sheet. The pot is heavy and it is not easy to hold with one hand while using the other to scrape all ingredients out with a spatula. It cools very quickly, so must be done fast. It is great to have a second set of hands at this time. Of course, I wasn’t thinking or helping. Just taking photos! Gloves go on at this point. 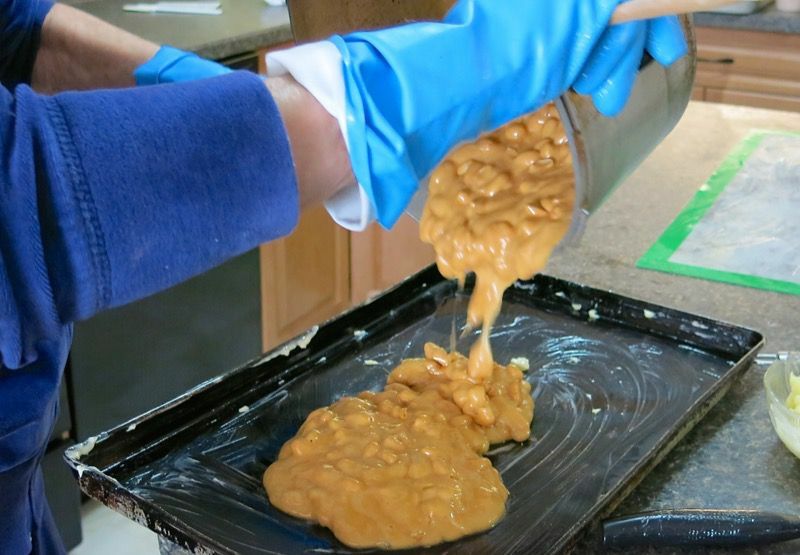 Mom picks up the pan and gives it a good shake to distribute and thin out the brittle, then upside down it goes onto the prepared counter top, to the thermo-mat. 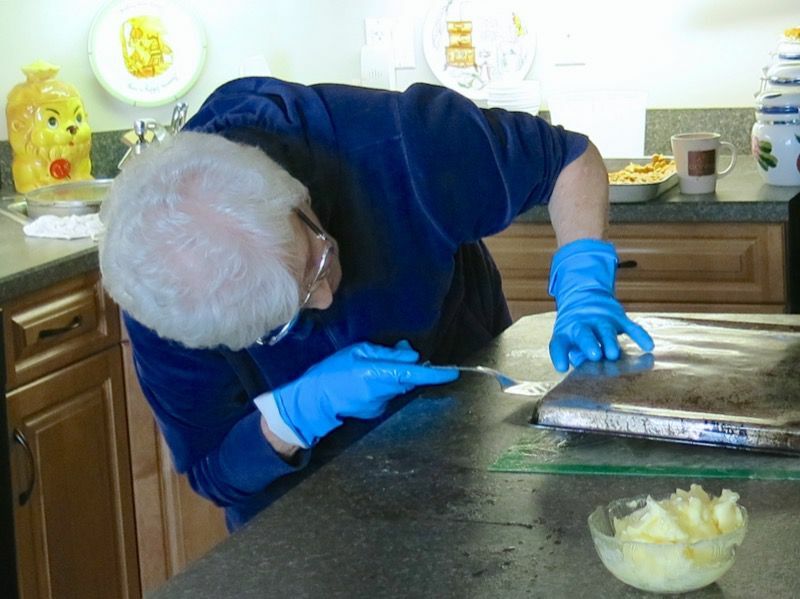 First, she did loosen the edges and corners of the brittle on the cookie sheet to ensure it would flop out. 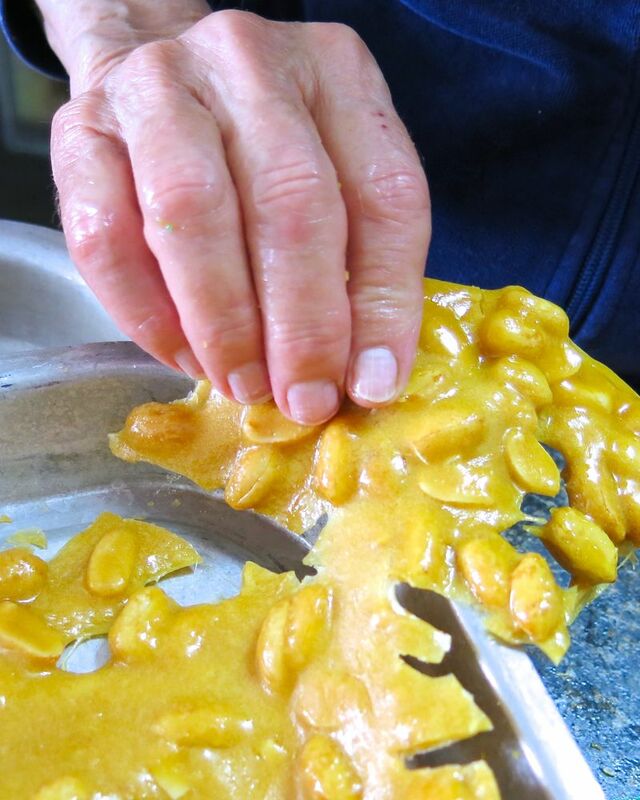 Quickly, the “skin removing” hot brittle must be thinned with the gloves on before it is no longer pliable. Confidence is a good part of this process. I would be freaking out to see the holes and the pulls in the candy, but there is no problem with this. 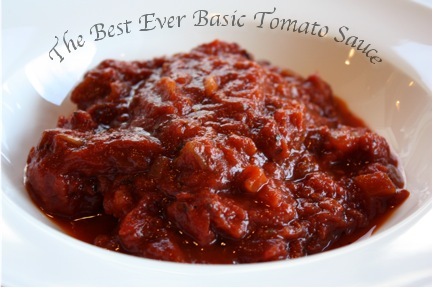 It is necessary and adds to the varied appearance and homemade quality of this delicious concoction. 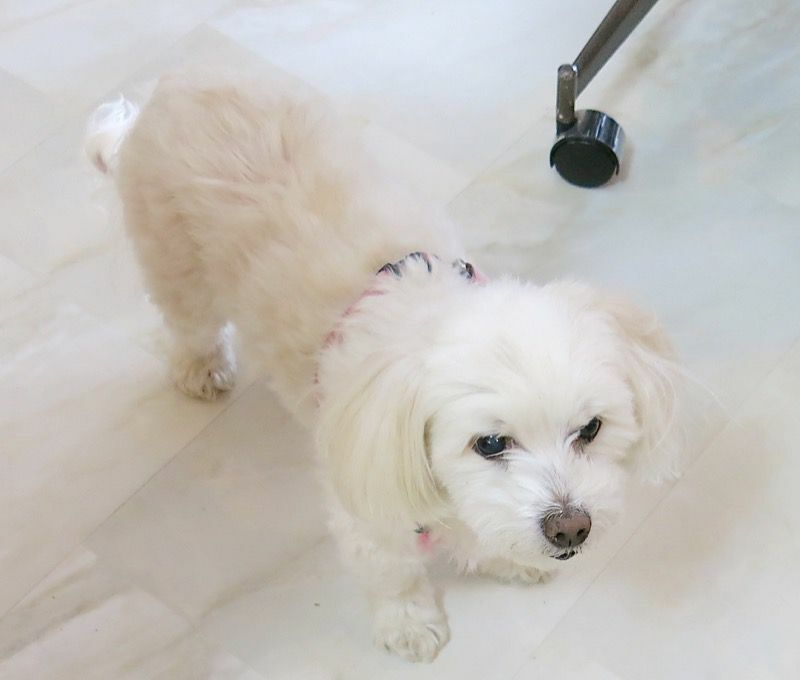 My baby sister, Penny, watches on. 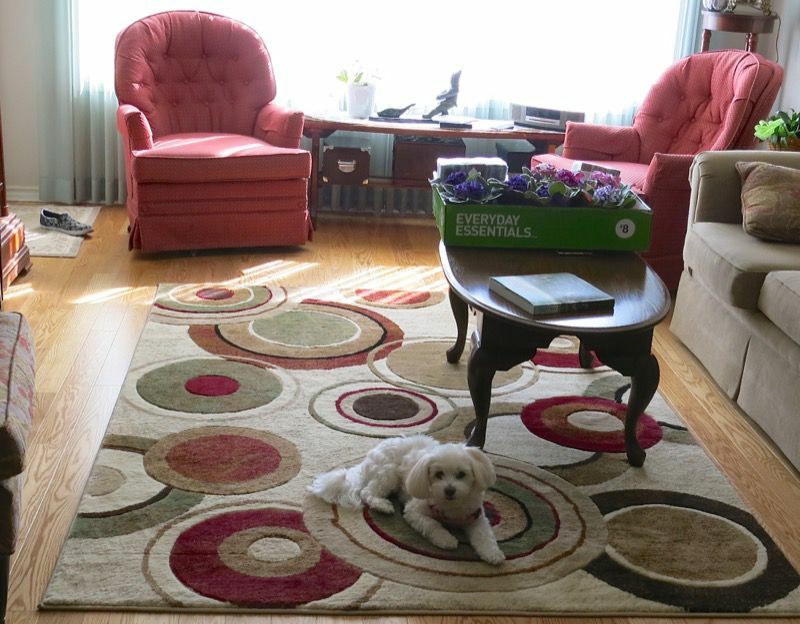 Reminding me of the time I was here with mom making her angel food cakes, I turned to take a photo of her living room where Penny watches, and there was the chair that dad was grinning in at that time. You can see him when I wrote about mom’s angel food cakes. Immediately, I was overcome with sadness. I miss my dad. 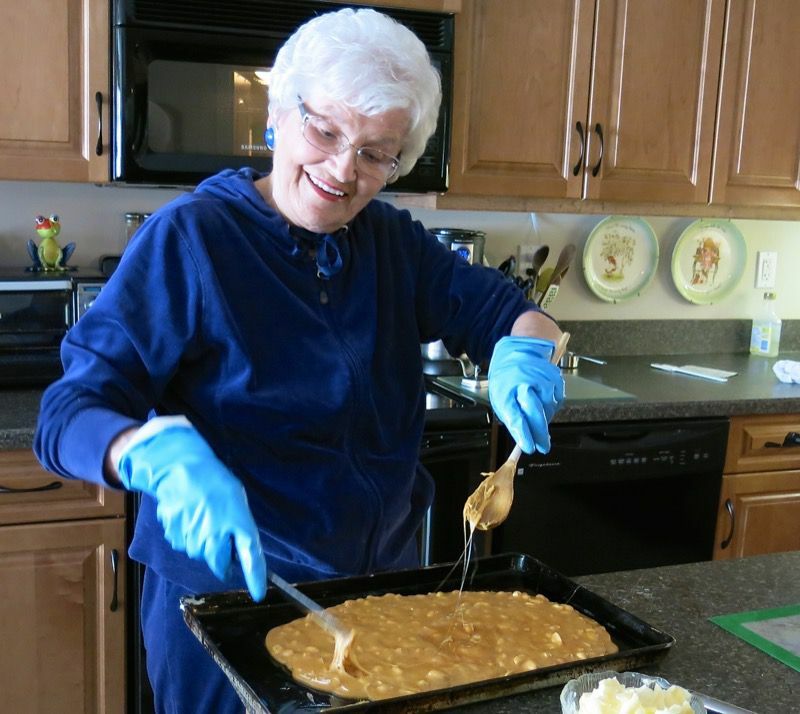 Oh, how he loved mom’s peanut brittle. 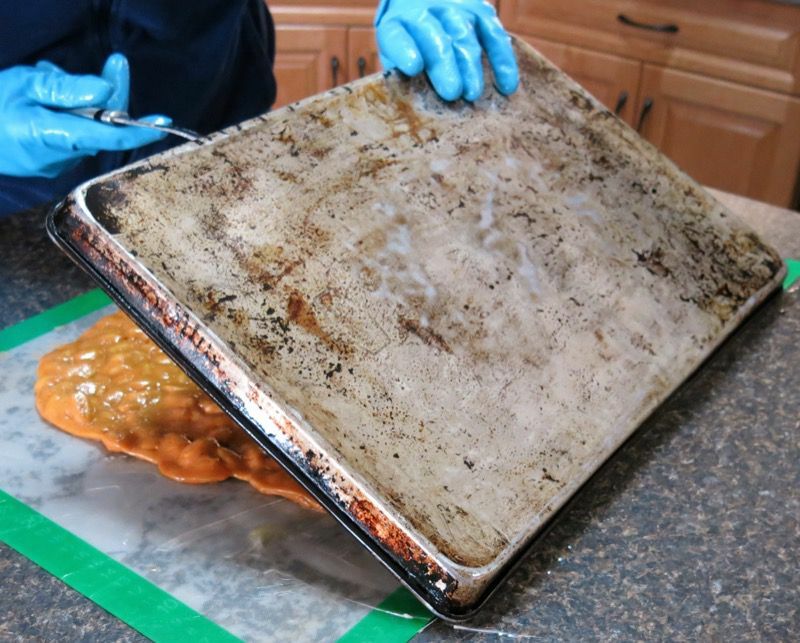 When doing several batches, mom moves the brittle from the thermo-mat on the counter to another couple of cookie sheets or containers, as above, to cool to room temperature so she can prepare the mat and the teflon cookie sheet for the next up-coming batch. She then breaks the brittle into chunks for serving and storing. Five batches made the amount above. Mom made it look super easy. Everything was spotless at all times. 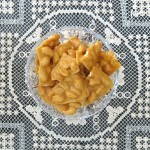 Interestingly, only mom and dad love this famous family sweet. I appreciate it, but it is not my thing. My gals and my husband could take it or leave it. It was the same with my sister. 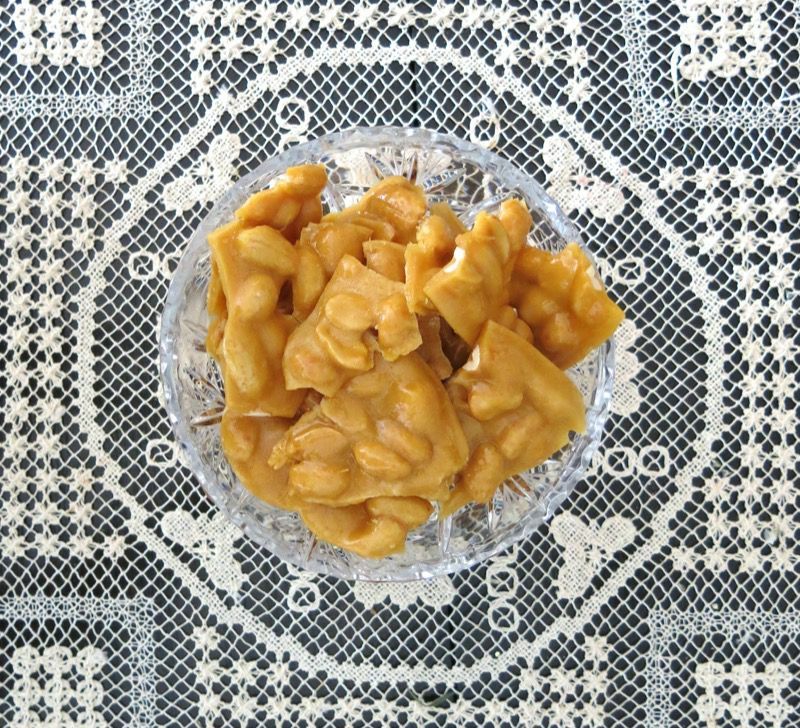 Yet, each of us recognizes that it is the best peanut brittle any of us have ever eaten; peanut brittle is just not “our thing”. Odd, no? Such a labour of love lost on those most beloved. Yet, this recipe, preserving it, and learning how to make it is important to me. 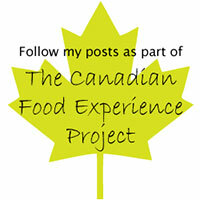 It is an important part of our family culinary tapestry and the tradition must be captured and preserved. So, I can see I will be giving this a go myself, next year! If you try it, chime in. 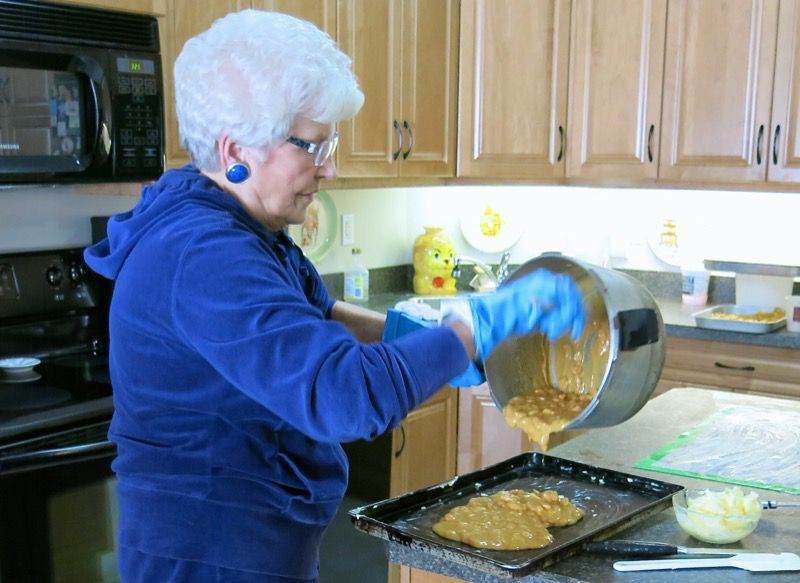 Mom has been making this recipe for 40 years. 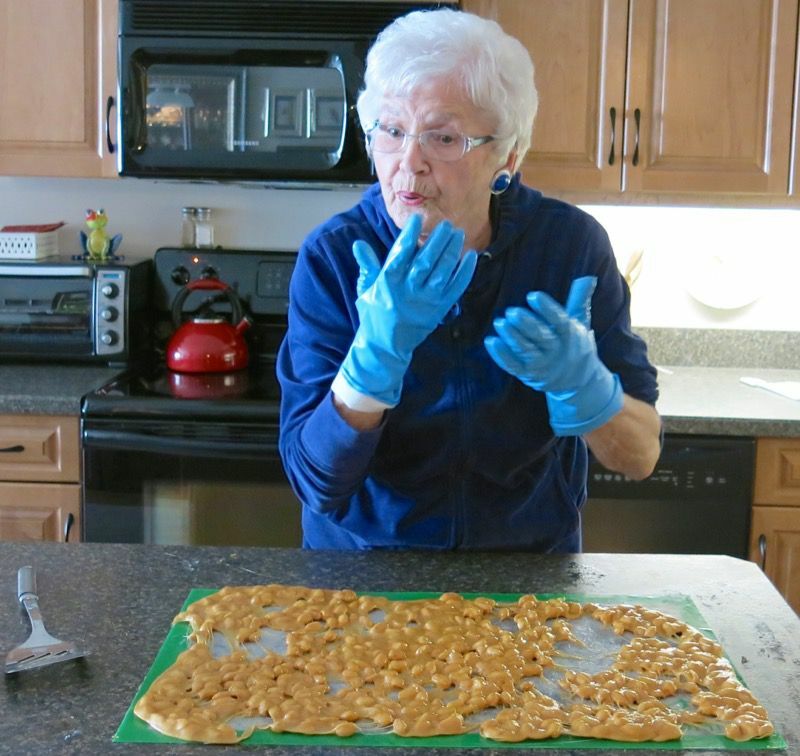 She calls it "Raw Peanut Peanut Brittle". 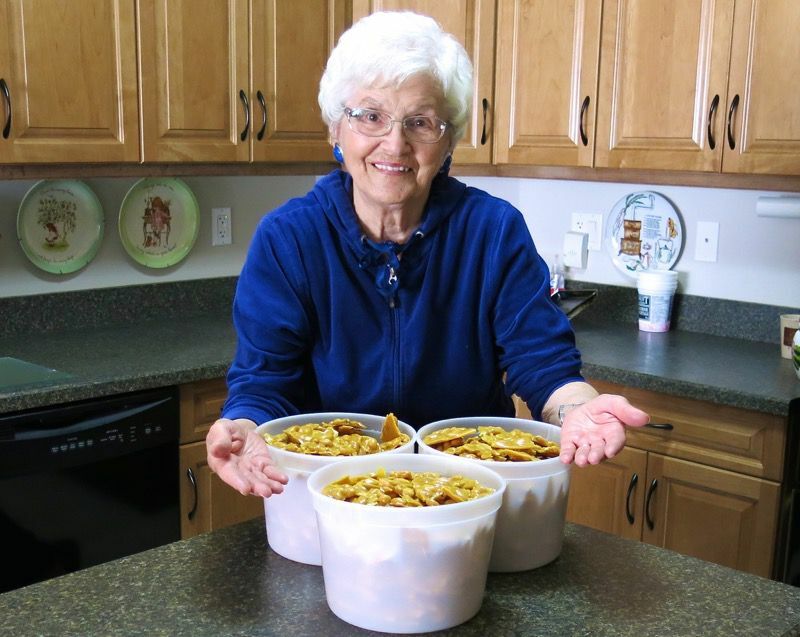 She is 85 and makes it several times a year, and never less than 5 batches at a time. 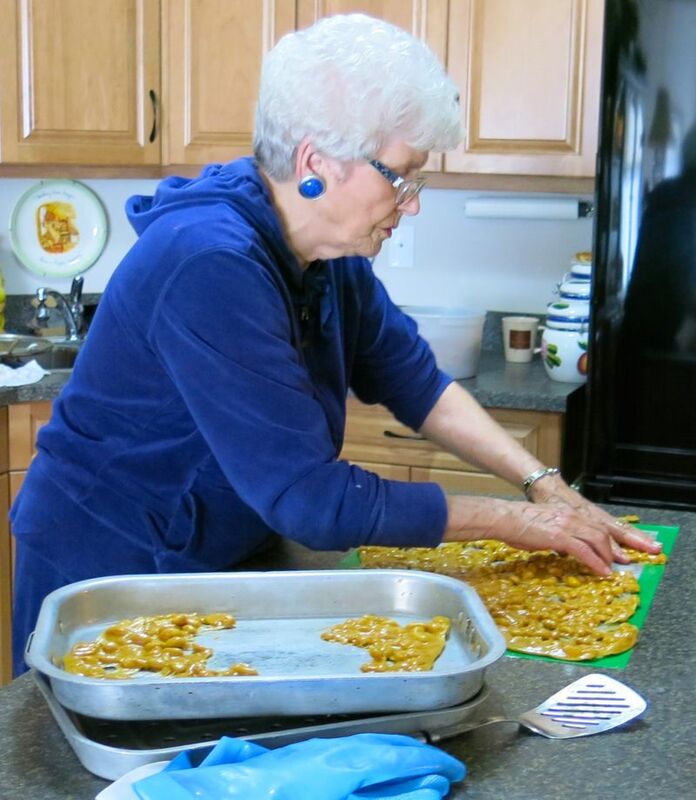 She and dad used to make it together and would take a day and make 20 batches. Obviously, she gives it away, and over the years, it has become the most coveted gift by all in our area. Author Valerie Lugonja via Helen McKinney her mom! Three batches fills 2 four litre ice cream buckets. 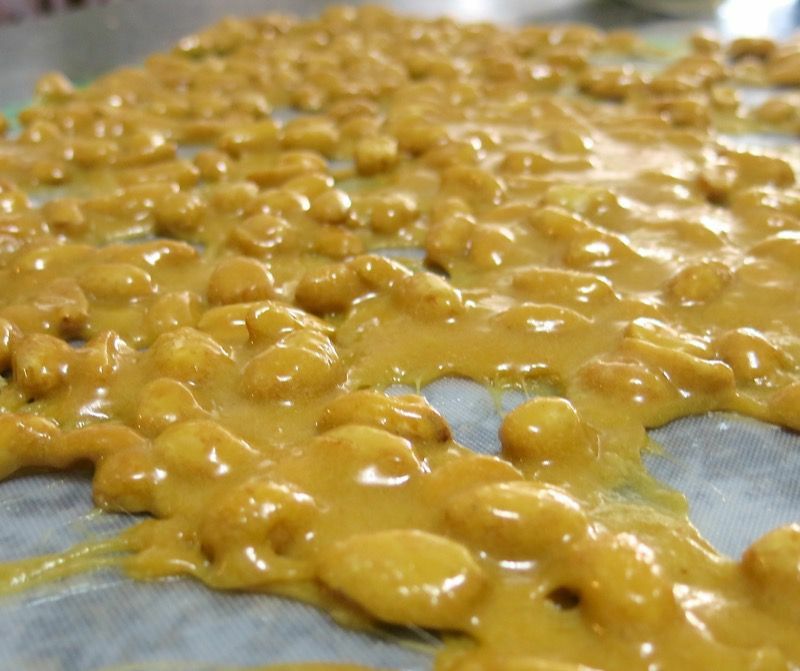 Don't use anything but raw peanuts in this recipe. They can be purchased at Bulk Barn if there is one in your area. 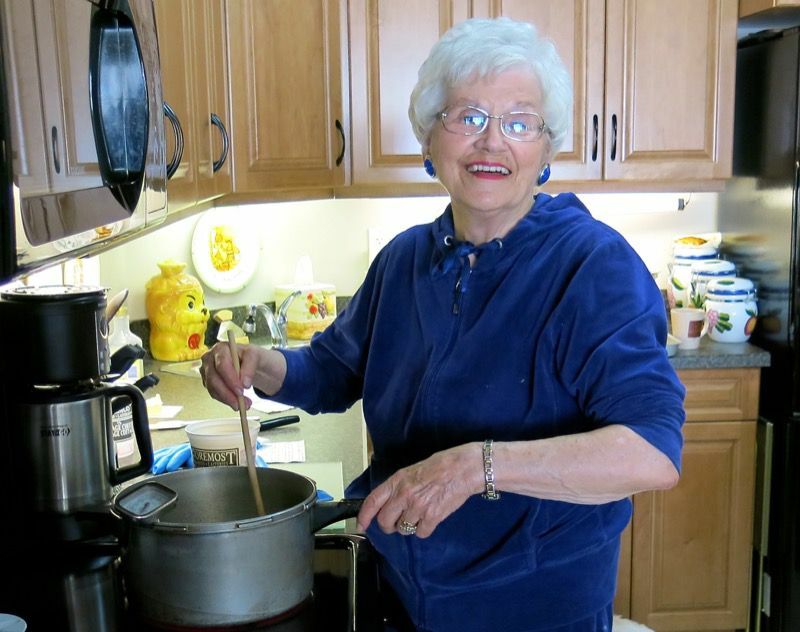 Special Note: Mom pours the measured corn syrup into the heavy pot with the sugar, and then measures the hot water. She then pours the hot water into the measuring cup the corn syrup just came out of to get it all and to clean out the cup. 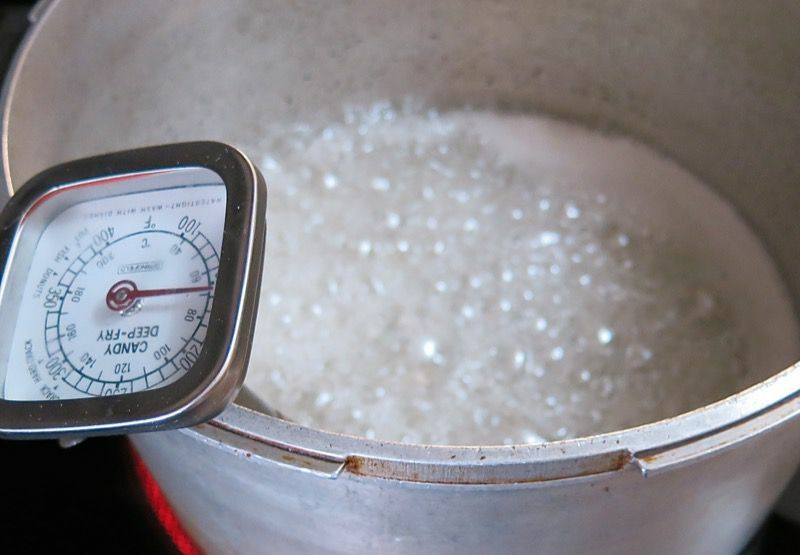 That pre- measured hot water then goes into the heavy pot with the corn syrup and sugar. 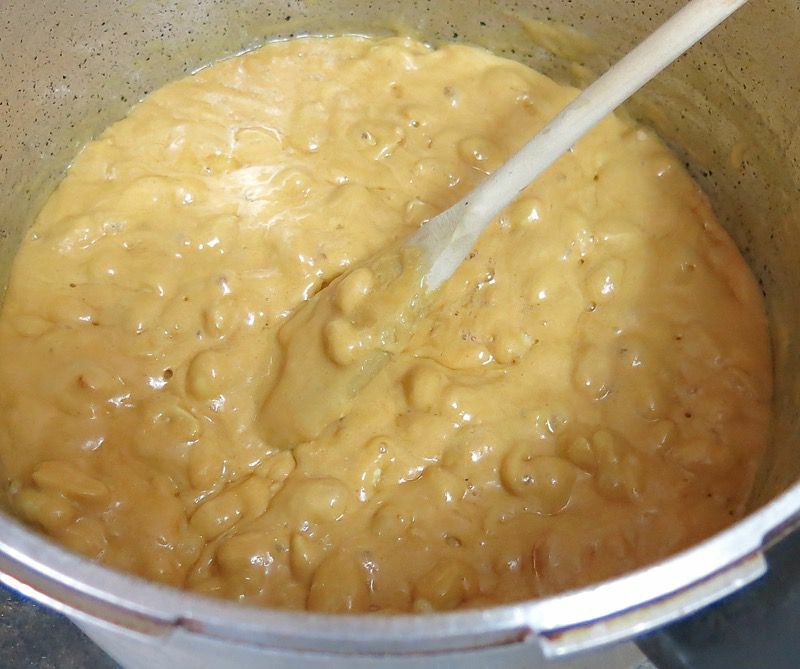 Mom will tell you, this is “the only recipe” worth making if you love peanut brittle. Lovely tribute to your Mom. 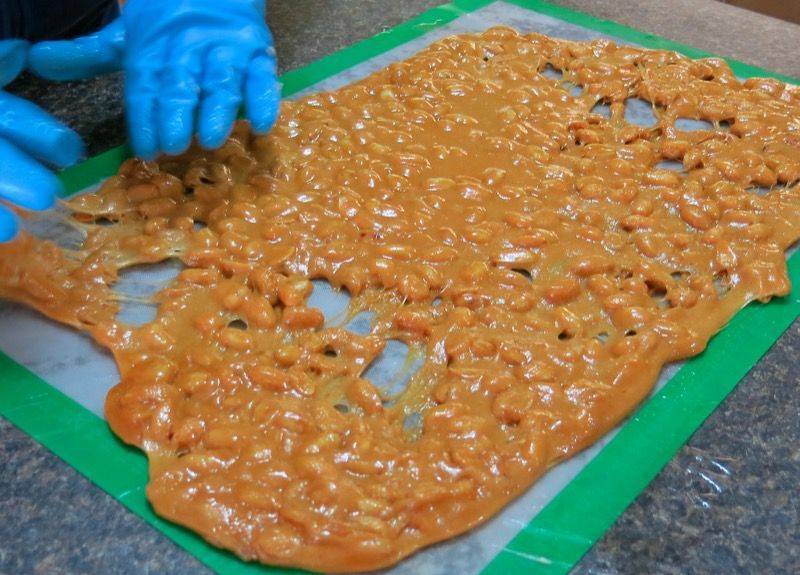 And wonderful peanut brittle. Too bad people would rather buy packaged food rather than good home cooking. 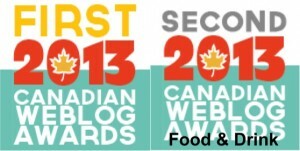 So lovely to hear from you and “ain’t that the truth!” Heading to the Slow Food in Canada conference in Montreal next week. It would be so wonderful if you could come. For some reason, I am no longer getting notifications of your posts in my mailbox. I am going to check on that right now. What a great post. The heavy pot your mom uses looks just like the heavy pot that my mom would use for peanut brittle and sponge toffee. 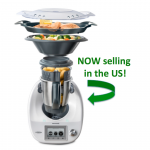 Hers was the base of a pressure cooker, and I wager your mom’s is too. 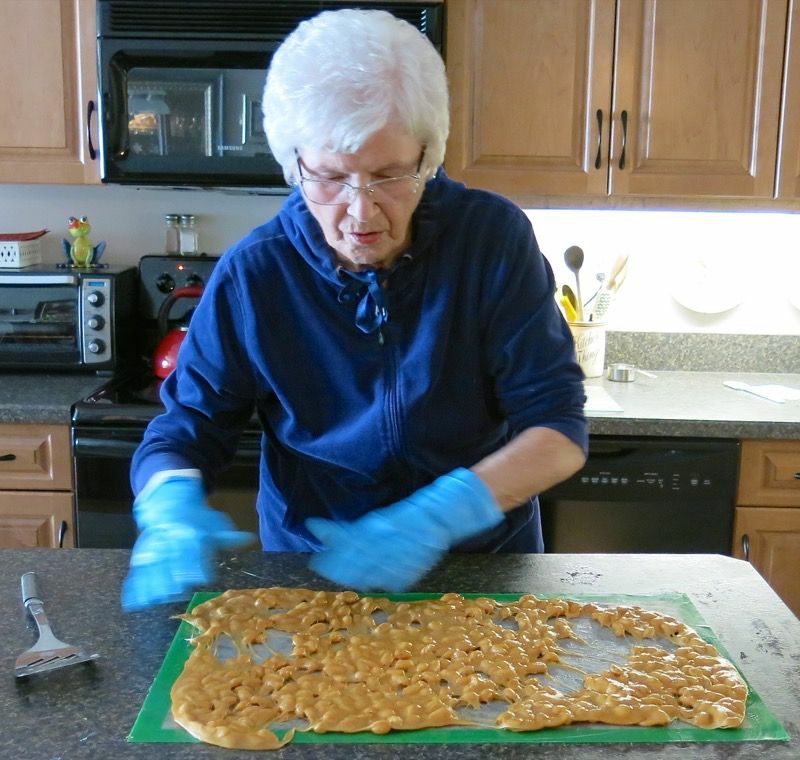 I thought my mom’s peanut brittle was the best also, so we can agree to differ (plus the recipe was probably identical). 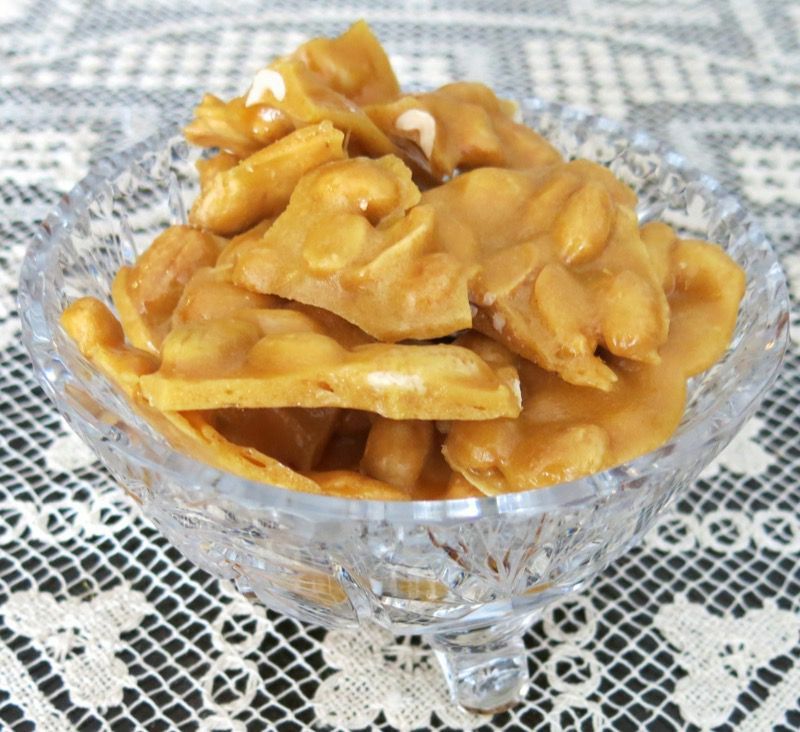 I make peanut brittle now (using the microwave) but more often make almond brittle. 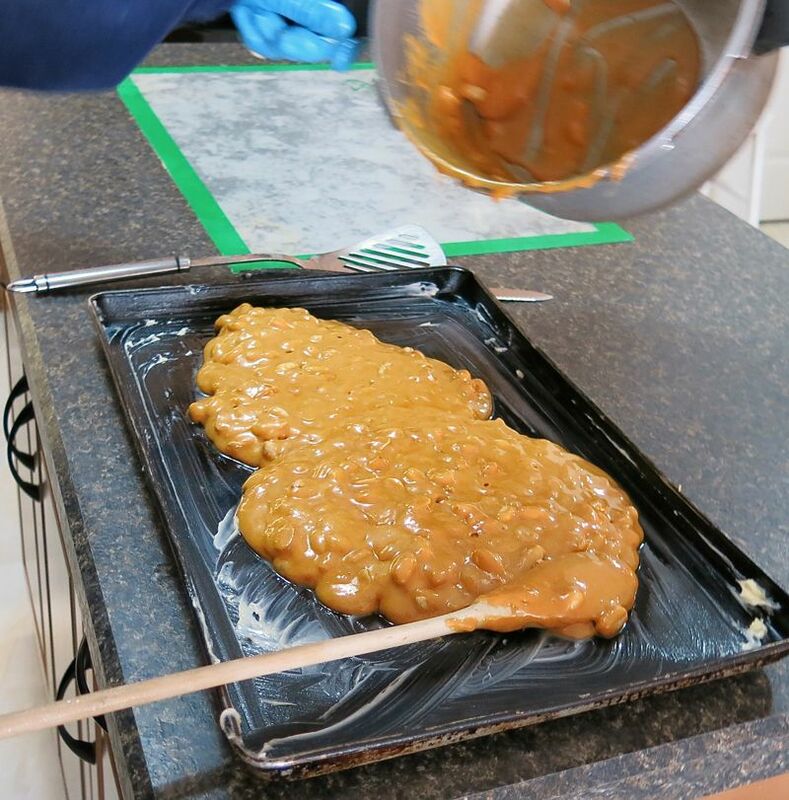 The brittle can be tweaked by adding a spoonful of chipotle powder, if the regular peanut brittle isn’t cutting it for you. Lovely Mom. I always enjoy seeing her in your blogs. She looks especially nice in blue. 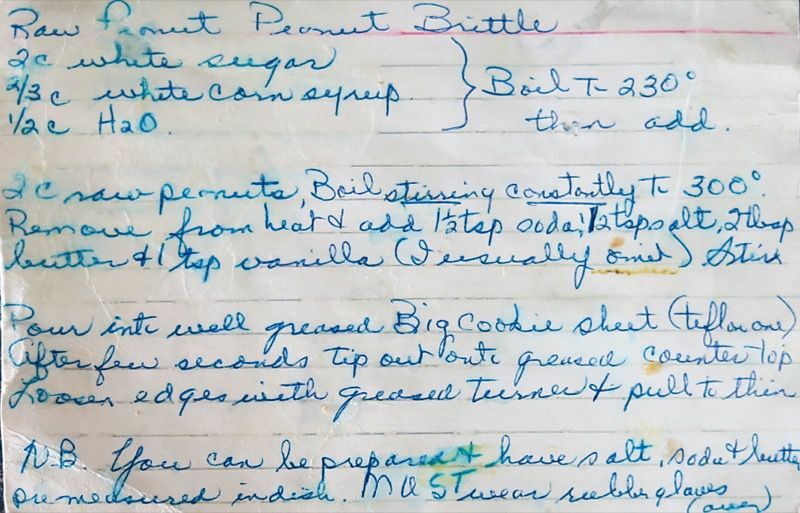 Her hand-written recipe on an old index card brought back memories of my mother. I treasure my mom’s old tattered book filled with recipes written on index cards, scraps of paper and envelope backs. Some are “clipped” from magazines with dates going back to the 1930’s. I so enjoy your blog and offer thanks for adding sunshine to my day. And you have added sunshine in my day – and my mom’s! She will be thrilled to read your comment. HUGS to you for that! 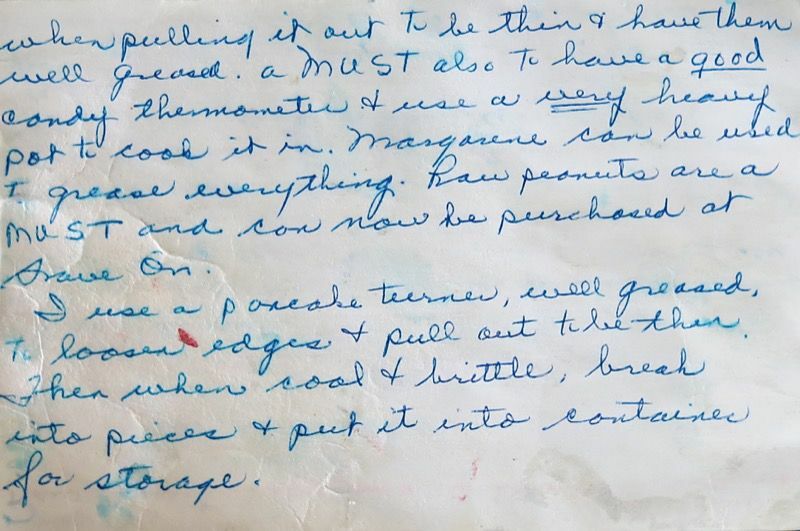 I do so cherish these hand written recipes, too. 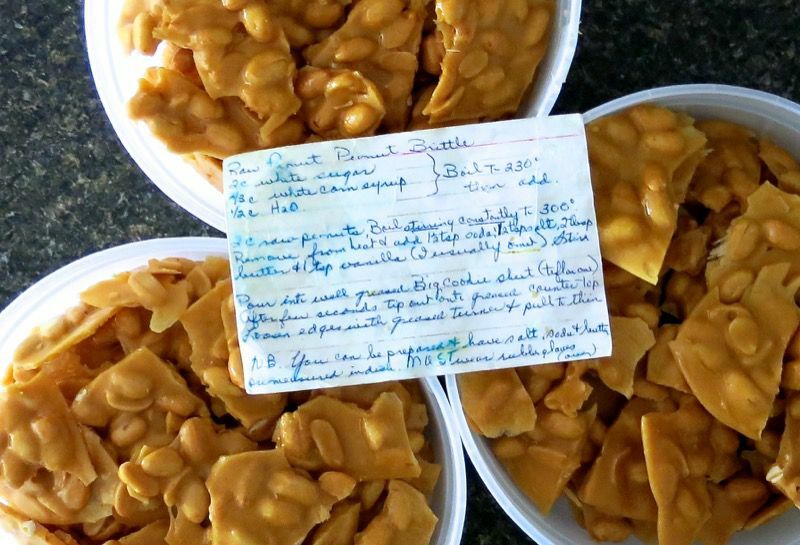 I had mom write all of her tried and true and our traditional family recipes on index cards for each of my gals for when they married and I did the same with my favourites. I found a beautiful keepsake recipe binder, bought the photo inserts and the cards fit into it perfectly. This is the best gift I have ever given. Of course, they are not stained and dog-eared, but they are hand written with love. I remember those chain letters. They still exist, believe it or not, via email! Grrr. I find them like junk mail these days, with the internuet at our finger tips. 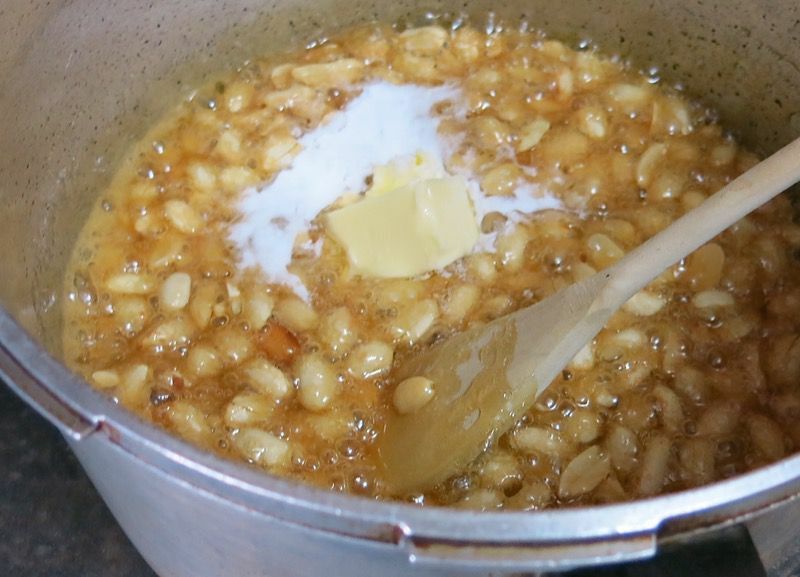 Thrilled to hear you have the same recipe and I guess this would explain how, too – as this one came from so far away, and then we changed it ourselves to the white raw peanut from the red skinned ones. 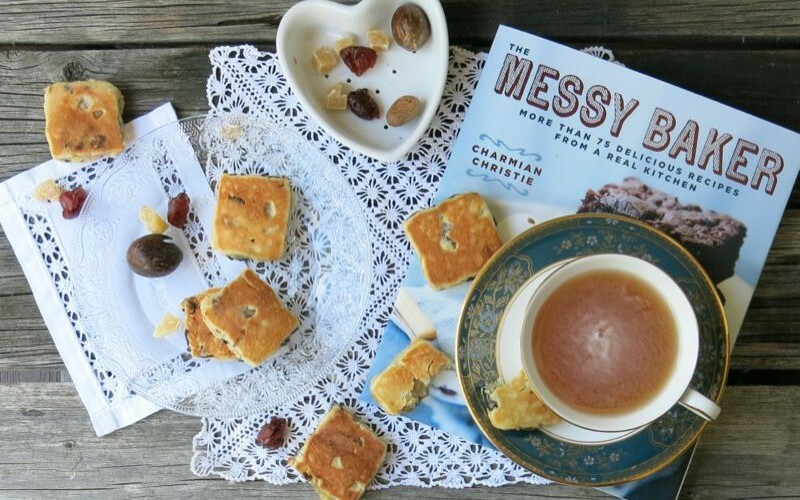 No one makes their own, anymore… but everyone sure appreciates getting a gift of a homemade batch. 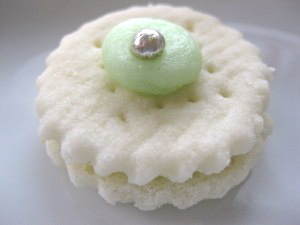 Nothing one can buy, even from the best confectioner, comes close. Oh what fun you two girls have. I would give anyting to do this with my mom Valerie..
Two prett ypretty girls w/ great smiles.. I love having someone I can take photos of..your mom is the ideal model for you!! And she loves the camera! I can tell because it loves her. 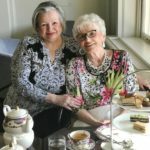 Thank you for sharing this heirloom recipe..
We used to look so much more alike – before I gained my weight and she went that wise and wonderful “white”! celebrated her big event yesterday, and “Oh, what a time it was, it really was!” She deserved every minute of the glory and I know it was truly a huge amount of fun for her. 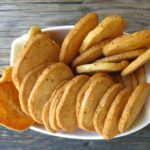 Lovely recipe Valerie ! 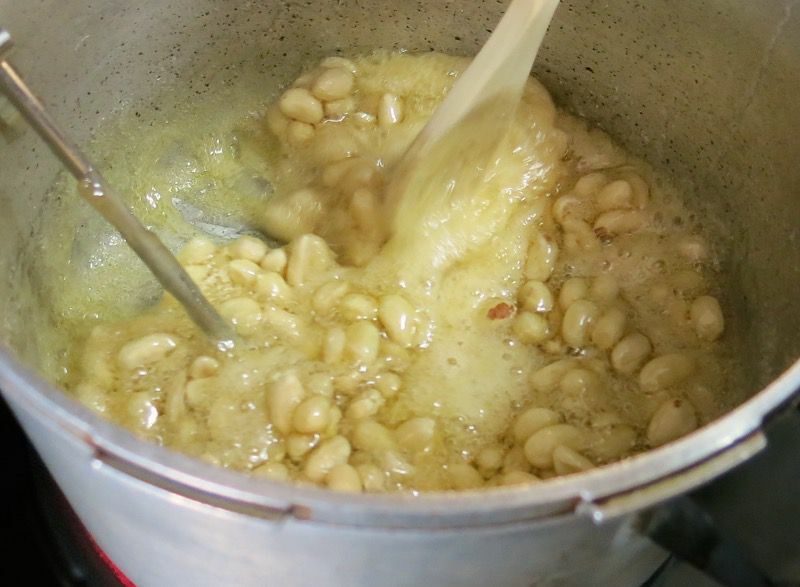 Certain foods evoke a time, place, a person … This is a family recipe enjoyed by all ! 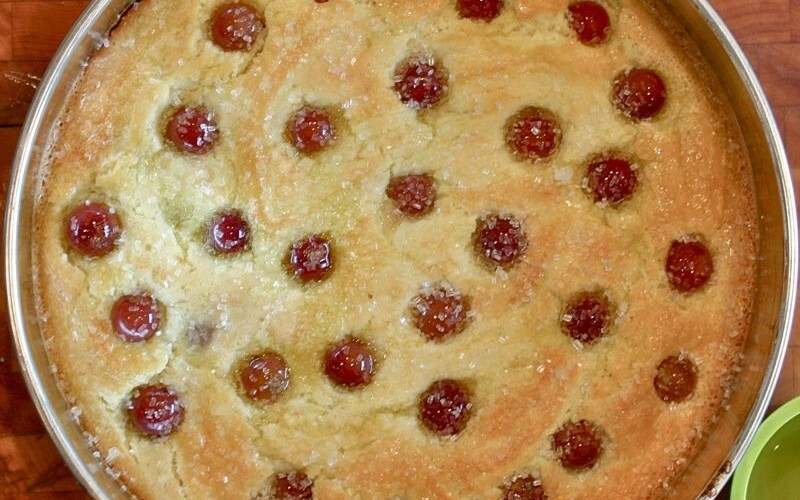 Family members as well as friends are lucky to see your Mum prepare this treat ! So wonderful to hear from you! It has been a blustery cold Spring out East, no? 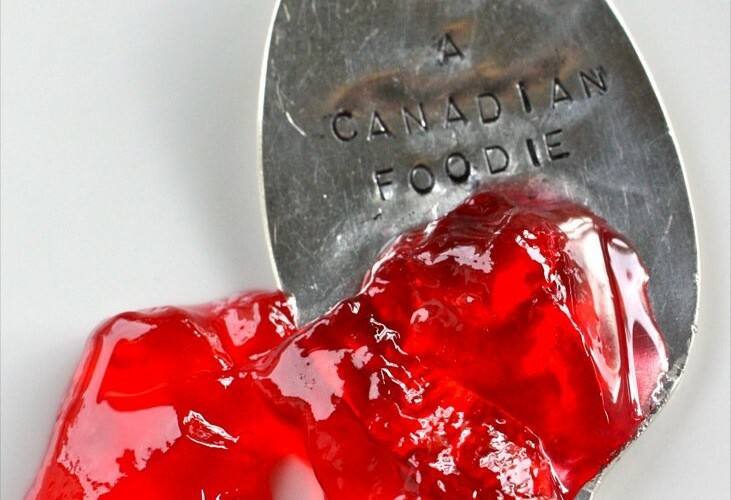 So worried about the Maple Syrup Farms and the wineries out there. Lovely to hear from you. 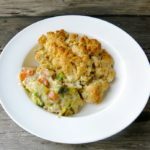 I love your site, and seeing your happy mom in the shots and of course the recipe looks so delicious! I may just have to try it. 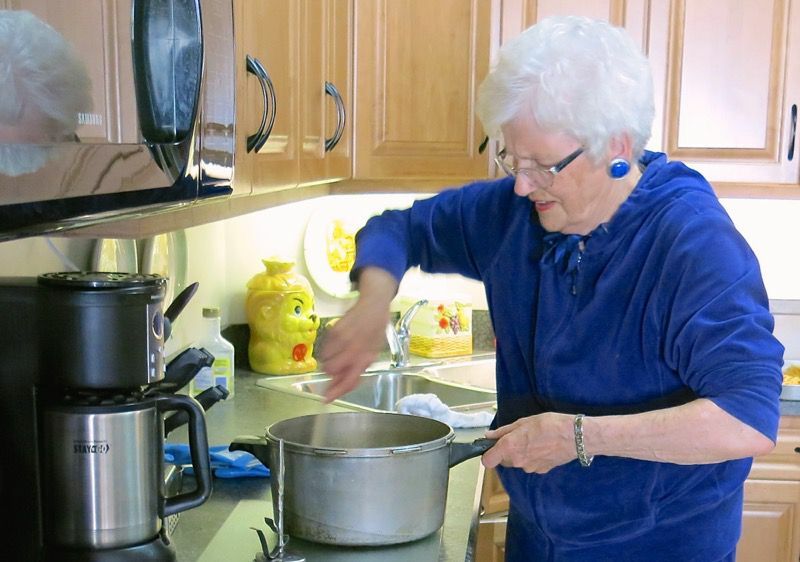 I know the value of having “mom’s touch” in our recipes. I have a hand written book from my own mom that I’ve started translating to our blog (in addition to our own stuff). Her recipes have no quantities so it’s hard sometimes, but I grew up with these meals so I eventually figure it out. Thanks for sharing… your pictures are heart warming. Thank YOU so much for taking the time to chime in and make my day – and I am sure, my mother’s day! 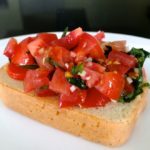 Love getting her recipes on this site and if you do try them, let us know. Hi from Australia! 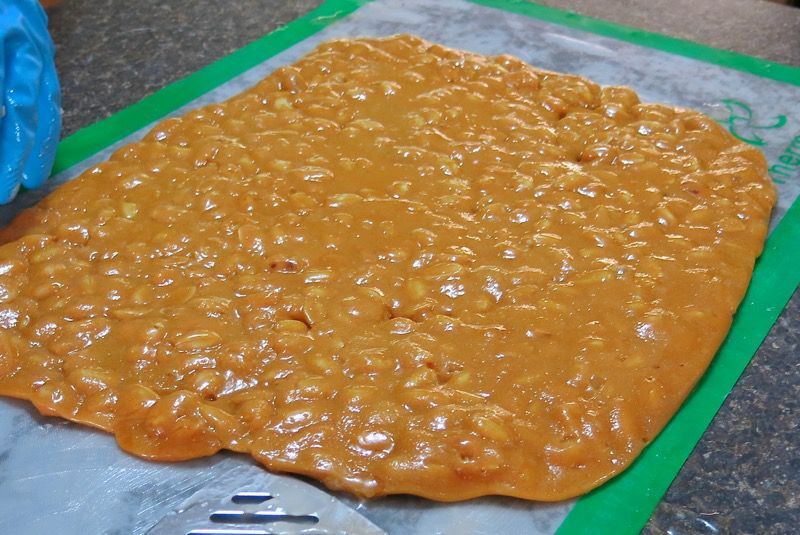 I made this peanut brittle for our Christmas day and it was a hit. Everyone loved it so I made another batch. So quick and easy. 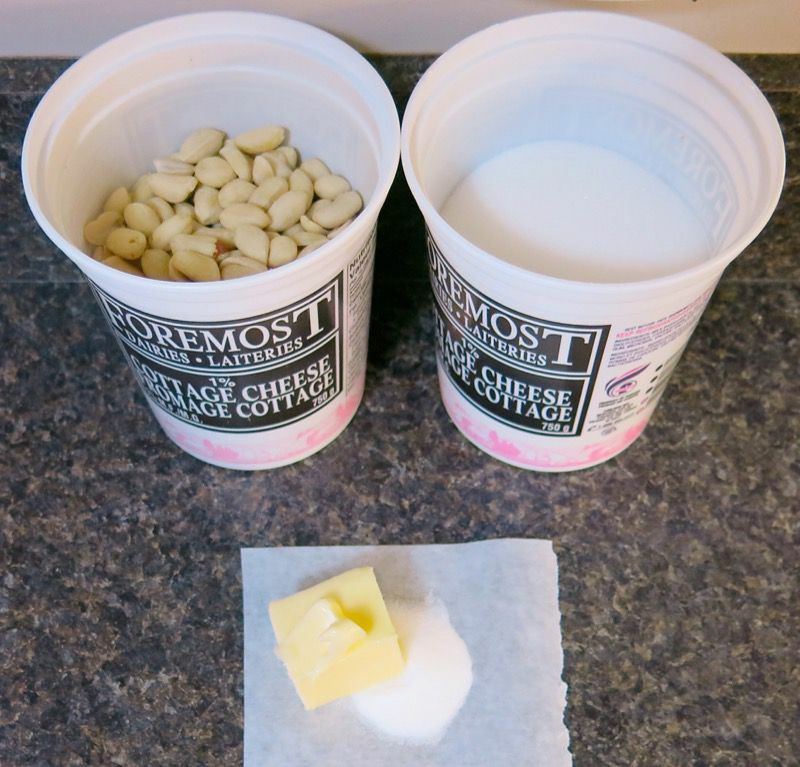 I could not find corn syrup so I used glucose syrup and I used salted peanuts so omitted the salt in the recipe. I did not have a thermometer so just went off sight by using the pictures you posted. 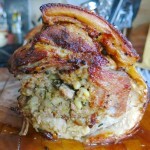 Thanks so much for the great recipe and photos. Happy Holidays! 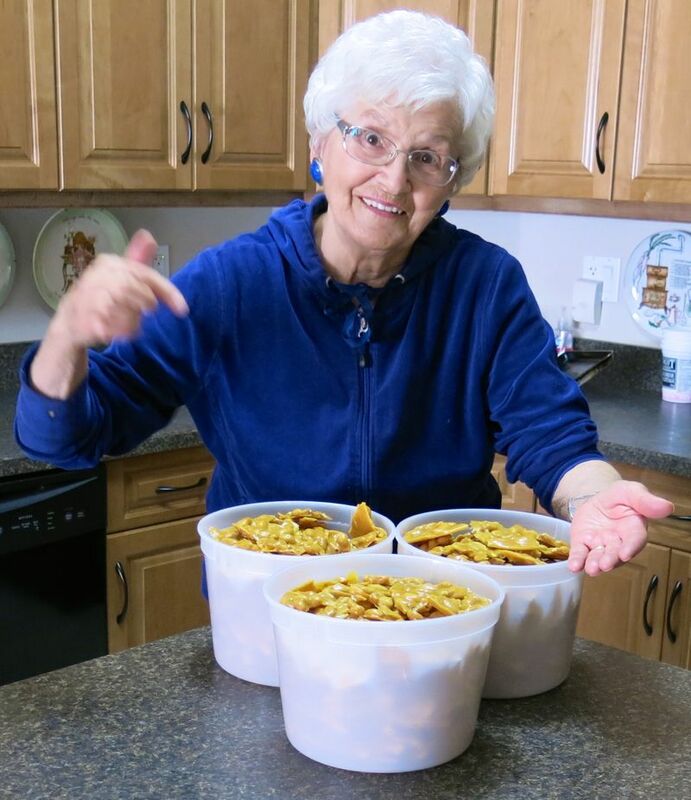 Wonderful to hear that you loved the recipe and it worked for you, Mary! I would suggest you try to find raw peanuts. They make ALL the difference. 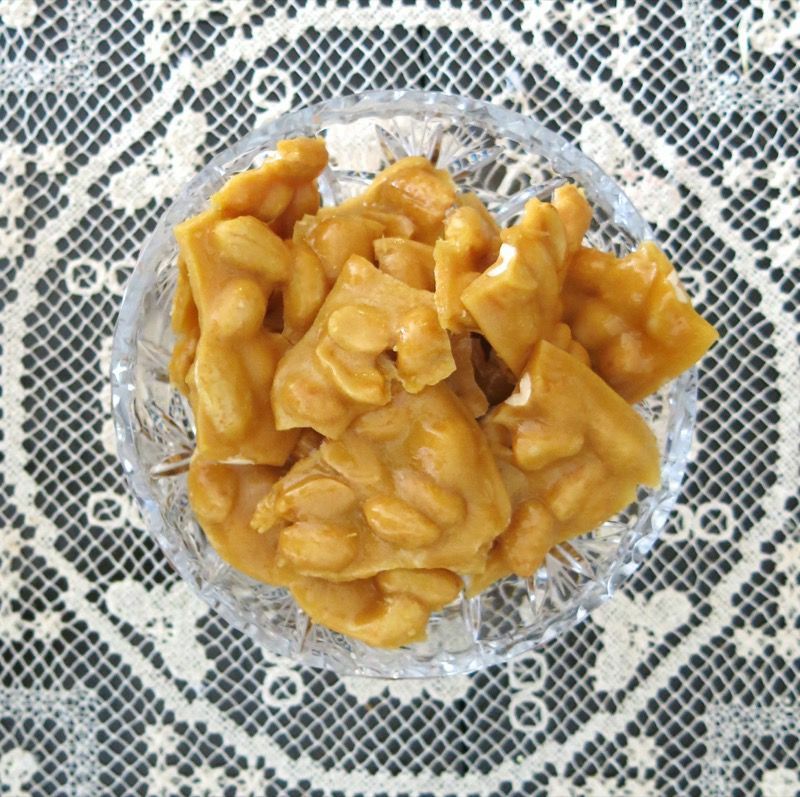 If you like the recipe using the roasted salted peanuts, you are going to die and go to heaven immediately once you taste it made with the raw peanuts! Raw peanuts definitely tastier! My husband said he didn’t think it would make a difference but he is now raving about it with the raw peanuts. Thank you. So glad you tried it Mary. It makes all of the difference! Mom will be thrilled to hear you enjoyed it, Jean!